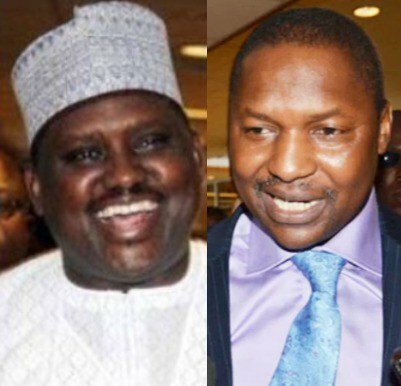 Justice Binta Nyako of the Federal High Court sitting in Abuja, today rejected a request from the Attorney General of the Federation, Abubakar Malami, to stop the National Assembly from probing the controversial reinstatement of former chairman of the Presidential Taskforce on Pension Reform, Abdulrasheed Maina, into the Federal Civil Service. Maina who has been declared wanted by both the EFCC and INTERPOL, was dismised from the civil service in 2013 after he was indicted in a N2 billion fraud. His reinstatement into the civil service in October 2017 caused an uproar and after much public outcry, President Buhari ordered his dismissal from the service and for an investigation to be carried out on how he was reinstated. The Senate had on October 24th 2017, mandated its committees on public service, internal affairs, anti-corruption, establishment and judiciary to probe the circumstances of Maina’s return to the country and the public service. The Attorney General appeared before the panel on November 15th and denied any involvement in Maina’s reinstatement. Malami then approached the court to determine if the Senate has the power to investigate the employment, disengagement, attendance, reinstatement and/or promotion of a civil servant. Rather than grant an order restraining the Senate from carrying out the probe, Justice Nyako ordered that the National Assembly be put on notice in respect of the application. The court fixed January 15th for the NASS to come and show cause why the interim injunction sought by Malami should not be granted.